Norton Mezvinsky, Ph.D., is an historian and a Distinguished Professor of History (emeritus) at Connecticut State University. 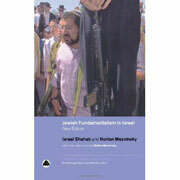 He is the President of the International Council for Middle East Studies (ICMES), in Washington, D.C. His book, Jewish Fundamentalism in Israel, co-authored with Israel Shahak, has been published in four languages in addition to English. Professor Mezvinsky was a faculty member at Central Connecticut State University for forty-three years. He has taught and lectured at numerous universities in the United States, Europe and the Middle East. He has written books and taught courses on the history of the modern Middle East, recent U.S. history, and Judaism at a number of universities. His many published writings include articles on Christian Zionism. Professor Mezvinsky has a B.A. from the University of Iowa and both an M.A. and Ph.D. from the University of Wisconsin. He was a research fellow at Harvard University.